Our 12 Days Of Christmas giveaway series is on overdrive this weekend as we fill our reader’s stockings with gifts, gadgets, and merriment. All of the contests this weekend run through Sunday night. 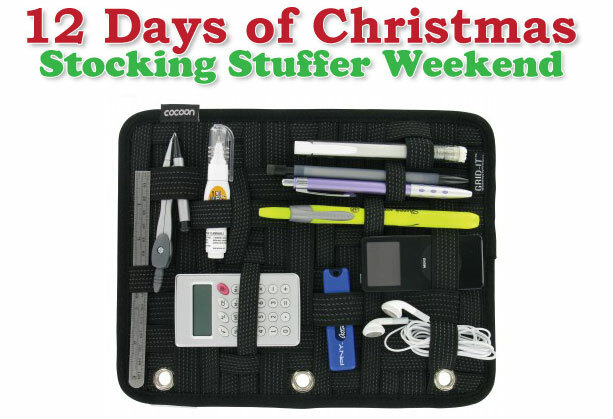 Technically, the 3-Ring Binder Grid-It Organizer from Cocoon will not fit into most Christmas stockings. It’s big. If that bothers you, please, don’t feel that you have to enter this giveaway. But for everyone else that can get over this little detail, we would like to pass along this fantastic item. Think of Grid-It organizers as a mobile catch-all. It tightly holds all your little gear, which is supremely more efficient than a junk pocket in your bag or desk. This version fits into 3-ring binders, but don’t view that as a requirement. It works just as well outside of a Trapper Keeper too. Do you need a bit of help in the organizational department? Click through for the giveaway rules and instructions. My computer bag’s crap: USB aircard, MiFi, bluetooth headset, random USB cables, pens, business cards, spare cell phone, a dozen or so flash drives, and a couple of Hot Wheels just in case I get board. Entries must be in by December 19th, 11:59pm PST. Be sure to use your real e-mail address! It will not be shared with anyone, period. It’s just for this contest. Keep your eyes out for more giveaways over the next two weeks and don’t forget about our big Santa item: a gaming rig valued at nearly $2,300. This contest runs through Christmas Eve!